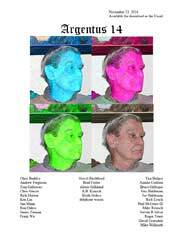 Argentus is an annual zine published by Steven H Silver. Dead tree copies may be requested from him at shsilver@sfsite.com or via snail mail at 707 Sapling Lane, Deerfield, IL. Steven also maintains his own page for all issues of Argentus, with LoCs for the current issue at : http://www.sfsite.com/~silverag/argentus.html.